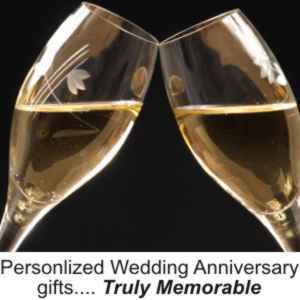 At CNS Direct Personalized Gifts we feature personalized wedding anniversary gifts for every anniversary occasion. Whether you need gifts of wood for a 5th wedding anniversary, or gifts of silver for their 25th wedding anniversary, or gifts of gold for the 50th. or even an extravagant personalized gift for a 100 year anniversary....personalized gifts create lasting memories of the anniversary commemoration. The personalized wedding anniversary gifts available from this web site and CNS Direct Personalized Gifts have been selected as the most popular, unique, beautiful and practical gifts available. "Time has past, more time will follow, even until the ends of all time, will my love for you still grow"
A wedding anniversary...A time to celebrate the years...Years filled with the many blessing that living as a couple can produce. A time to celebrate the two people, living as one...Two souls, one destiny, one love... A time to celebrate their love...A love that endures time, knows no limits, and is always true. Wedding anniversaries are to be celebrated by the loving couple and shared by those that their love has touched. Personalized engraved wedding anniversary gifts are a great way to express your feelings and to celebrate their love, while giving a gift that is, truly memorable. The wedding anniversary gifts available from this web site and CNS Direct Engraved Gifts have been selected as the most popular, unique, beautiful and practical personalized gifts available. Each gift includes generous amounts of free engraving / free personalization, to help you create a memorable message and truly unique and memorable personalized wedding anniversary gift.